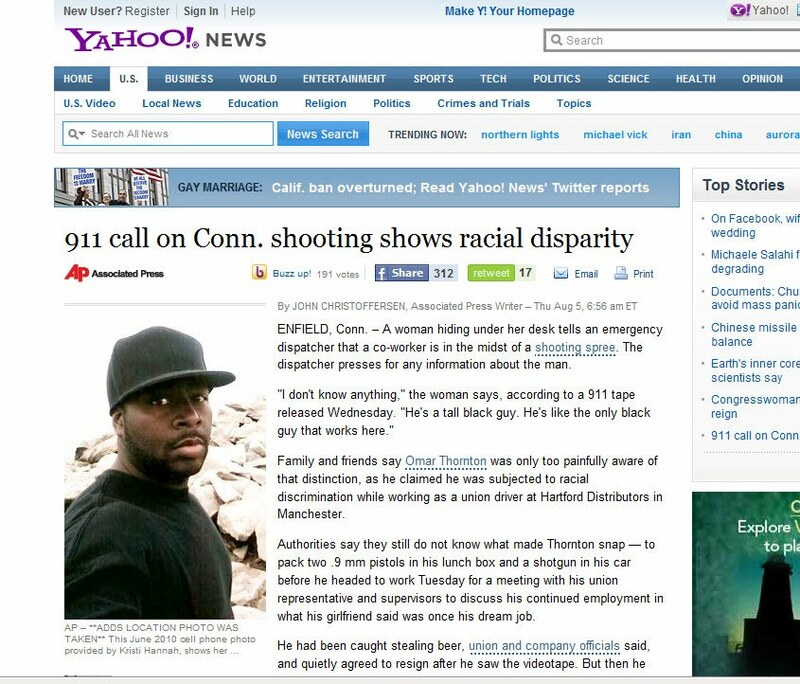 My head is going to explode over this headline: "911 call on Conn. shooting shows racial disparity". I don't know who wrote the headline (Yahoo! or the AP), but it is completely misleading and racially charged. A woman hiding under her desk tells an emergency dispatcher that a co-worker is in the midst of a shooting spree. The dispatcher presses for any information about the man. "I don't know anything," the woman says, according to a 911 tape released Wednesday. "He's a tall black guy. He's like the only black guy that works here." How in the WORLD is describing the crazy mad shooter "racially disparity"? That has to be the dumbest, most inflammatory way to describe the caller's actions I can think of. Really, really bad form, AP and/or Yahoo! Super lame.